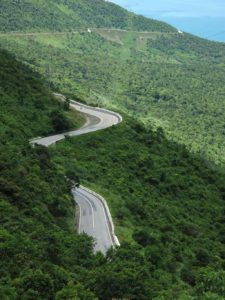 The winding, six-mile Hai Van Pass road was the most serious challenge during a two-week cycling tour of Vietnam that my wife and I took in late December. 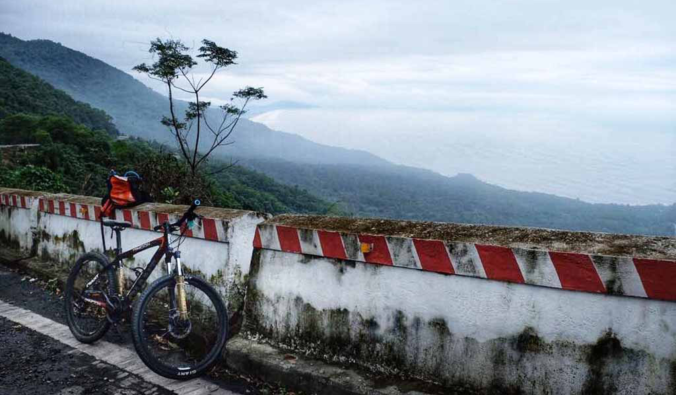 Bicycle touring, we discovered, lets you experience a country up close. You see how people live, smell the cooking, and hear children call “Hallo” as they rush to the road to try for a side-arm high five. 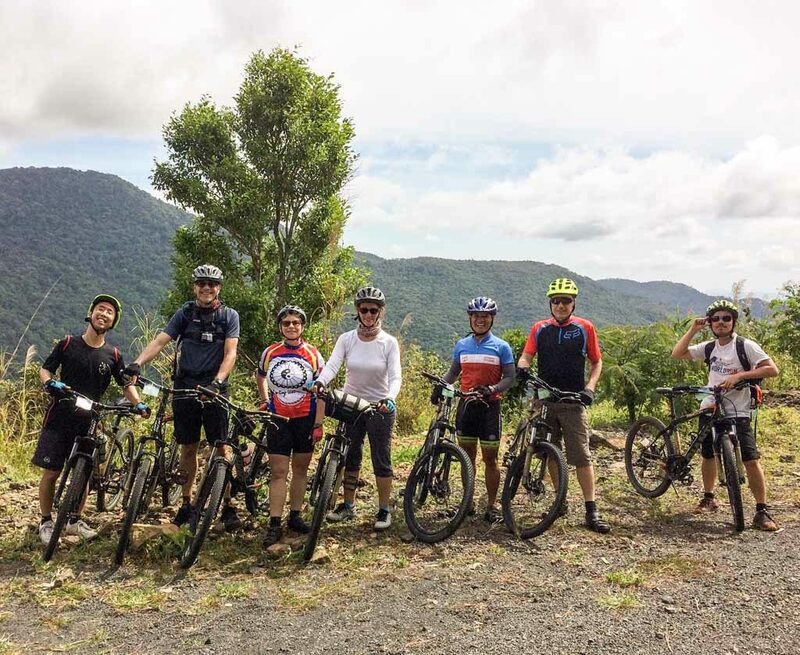 John, a 44-year-old Australian graphic designer who spends most weekends on a mountain bike, was first in our six-person tour to make it to the top of Hai Van Pass. It took him 38 minutes of pedaling, and he would have been close to the reputed record of 35 minutes if not for a chain malfunction. The rest of us took up to an hour and a half to reach the summit. Some pedaled constantly; others took short walking breaks. 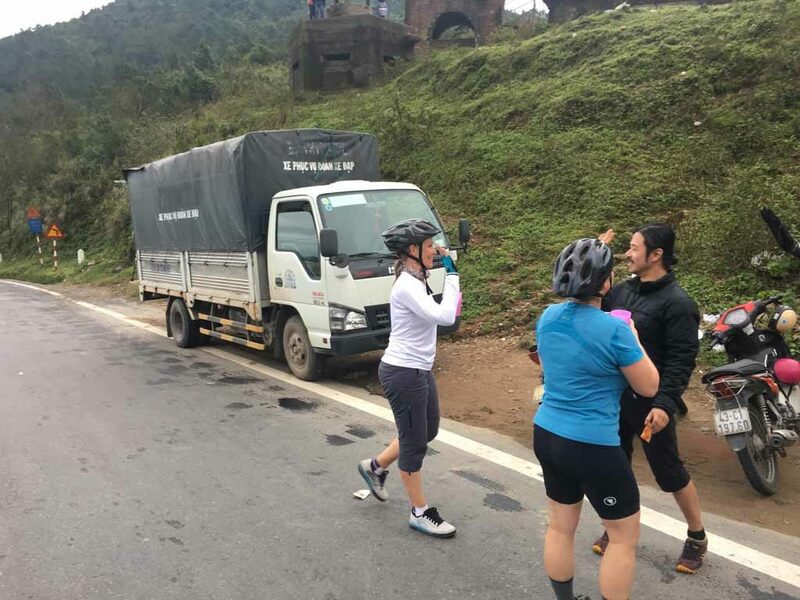 Sharon Hodges of Lakeland gets a high five from Andrew Goh of Birmingham, England, after she completed the six-mile bike ride up to the Hai Van Pass. Above them are bunkers that gave French and American soldiers a commanding view of the coast and a key roadway connecting Hue and Da Nang. My strategy: Start slowly and stay in the highest gears, the ones you don’t use in Polk County. Your feet spin quickly, and you go slowly, but it worked. I got to the top without getting off the bike — except when our tour leader rode up behind and noticed my rear tire was going flat. He phoned the truck that was trailing us, and the driver stopped for an emergency repair. Riders who don’t feel up to the challenge of the long uphill climb could hop on the bus that ferried us between rides, but nobody in our group chose to do that. We were four men and two women ranging in age from 33 to 64: two Lakelanders, the Aussie I mentioned, a Danish-Canadian dual citizen and two Brits. Intrepid Travel, the Australian company that organized the tour, is careful to vary the intensity of the rides. The ride preceding our intense mountain climb was a post-lunch, leisurely 9-mile circle around a placid lagoon. (Our 37-mile ride before lunch started slowly through villages and farmland and shifted to moderate speeds when we hit largely open roads.). We didn’t even get on our bikes the next day, letting our tired leg muscles recover as we strolled, shopped and dined through the old city of Hoi An, a UNESCO World Heritage site. 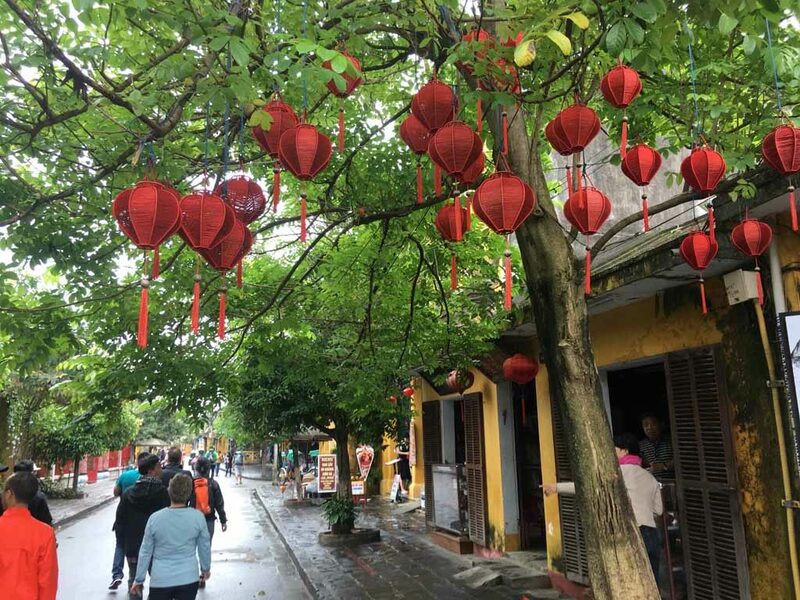 The old town area of Hoi An is known for its colorful lanterns. 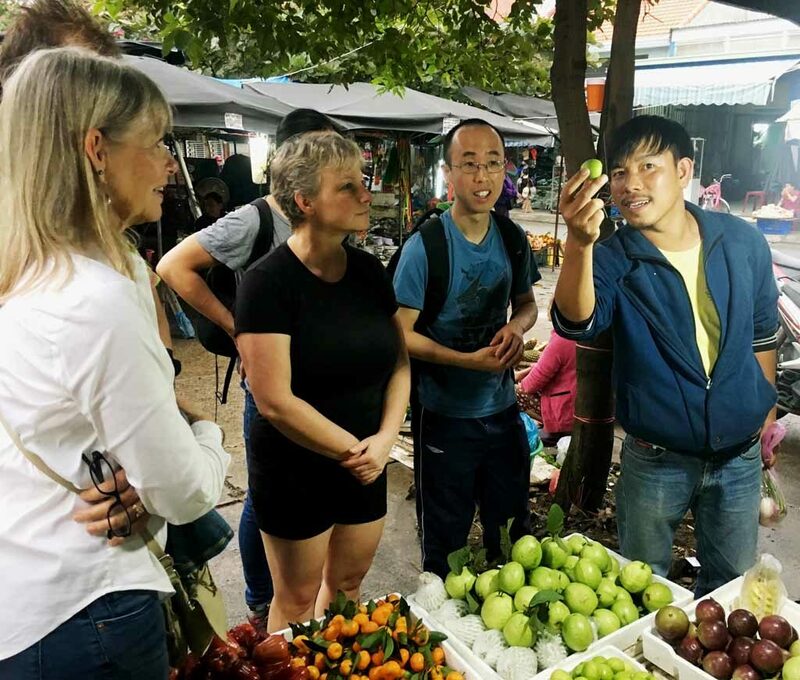 Chef Hao Le discusses fruits found in a marketplace in Hoi An in preparation for an evening cooking class. A typical day on the bicycle tour starts with breakfast at the hotel at 6 a.m. All of the hotels we stayed in were comfortable, though the quality varied from spartan to semi-luxury. (Our guide described one of the nicer lodgings as a three-star hotel built to look like five stars.) Buffet breakfasts typically offer familiar Western dishes (omelets, pancakes, cereal, breads) and Asian meats, noodles, rice, veggies and fruits. By 7, we were either on our bikes or on the bus. On lighter days, we might bike 20 miles. Toward the end, when we had all built capacity, there were several 50+-mile days. Our group was accompanied at all times by a local tour guide and a mechanic. We stopped every dozen miles or so for snacks of fresh fruit, sweets, nuts, and limeade. We also stopped for cultural tours most days. In Hue, for example, we visited both the abandoned French and American bunkers on a strategic hill overlooking the Perfume River and the ancient walled city. Lunches were uniformly excellent. Most were at non-touristy restaurants that we probably would have passed by without a guide who knew where to get tasty food reflecting regional cuisines. All of the restaurants and hotels that Intrepid uses are locally owned. 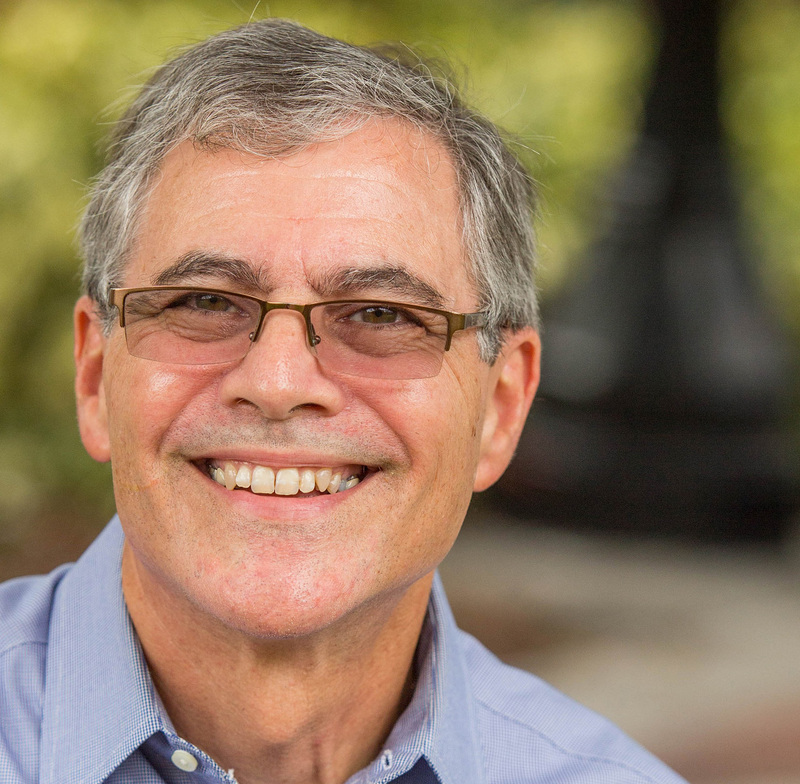 The company emphasizes low-impact travel and local economic sustainability. All Intrepid employees in Vietnam are locals, according to our guide, and I presume that is true of the other 120 or so countries where Intrepid offers tours. 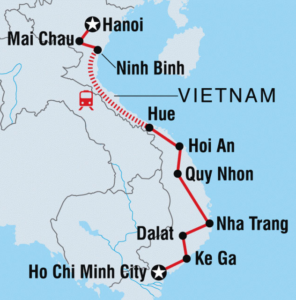 It’s 1,082 miles from Hanoi, where we started our trip, to the end point in Ho Chi Minh City. (That’s the official name; we were surprised that many locals still call it Saigon.) No, we didn’t bike that far. A significant distance was covered in an overnight train ride as well as bus journeys through mountainous areas and locations where the main route was a superhighway. Mostly, we biked on country roads, although we did get to compete with ever-present motorbikes and honking cars through some harried city riding. The mountain bikes issued by Intrepid carried us over just about every kind of surface: asphalt, concrete, dirt, gravel, pebbles, potholes, grated bridges, rain-flooded pavement, even a slender creekside path. The Vietnamese people we encountered were warm and hospitable. If there is any resentment over American fighting in the 1960s and 70s, we didn’t detect it among the people we met. However, the official line of foreign aggression is abundantly clear when visiting museums about the conflicts the Vietnamese call the Resistance War Against France and the Resistance War Against America. You sense that people are grateful for both the tourism and industrial investment that resulted as relations between the U.S. and Vietnam eased over the last two decades. In cities, particularly in the south, you now see Western luxury brands, and in markets you can get deals on clothing made in Vietnam for American and European companies such as North Face and Adidas. English skills are seen as a key to advancement. 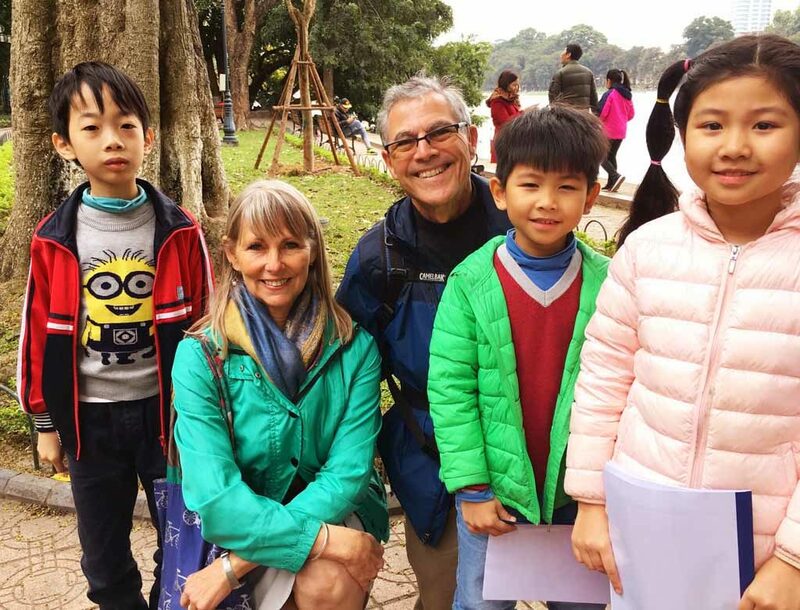 In a lakeside park frequented by tourists in Hanoi, we were approached repeatedly by children who wanted to practice their English skills with us. 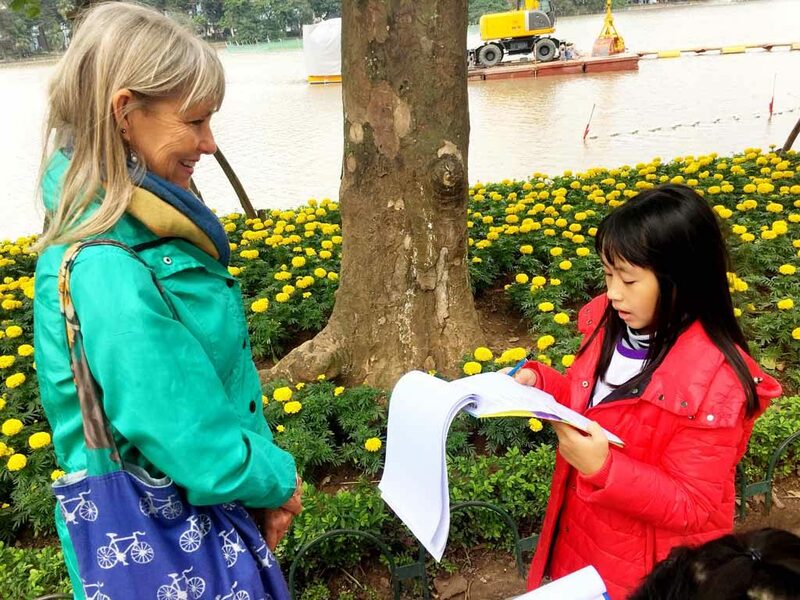 Sharon Hodges of Lakeland answers questions from a student who is practicing her English in a park by Hoan Kiem Lake in Hanoi. And did I mention the food? Our meals were excellent and inexpensive. After two weeks, I thought I had refined my chopsticks technique — until one night when we had dinner with the family of a young Vietnamese friend from Tampa who was home visiting her folks. Her amiable mom watched me picking up spotted snails and rice with chopsticks, and wondered aloud whether I’d be more comfortable with a fork. I smiled and pressed on with my chopsticks. 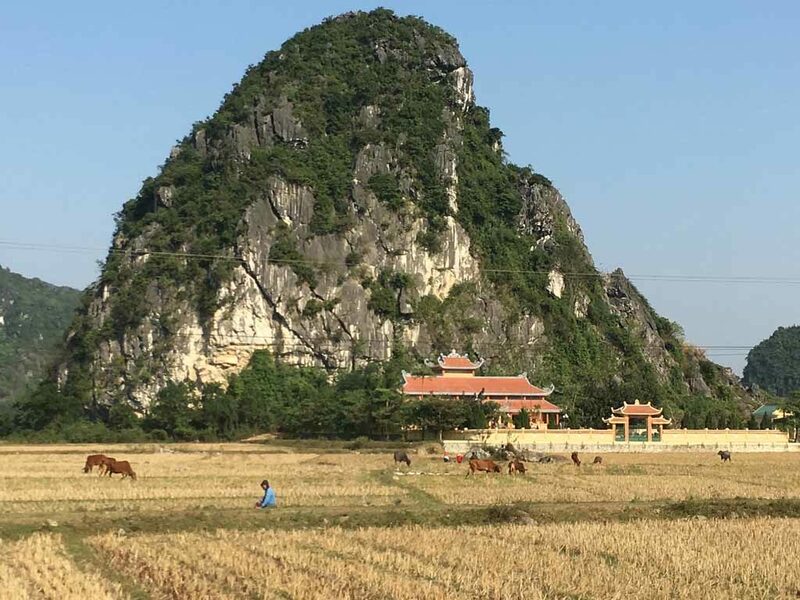 A limestone karst overshadows a Buddhist temple north of Ninh Binh. 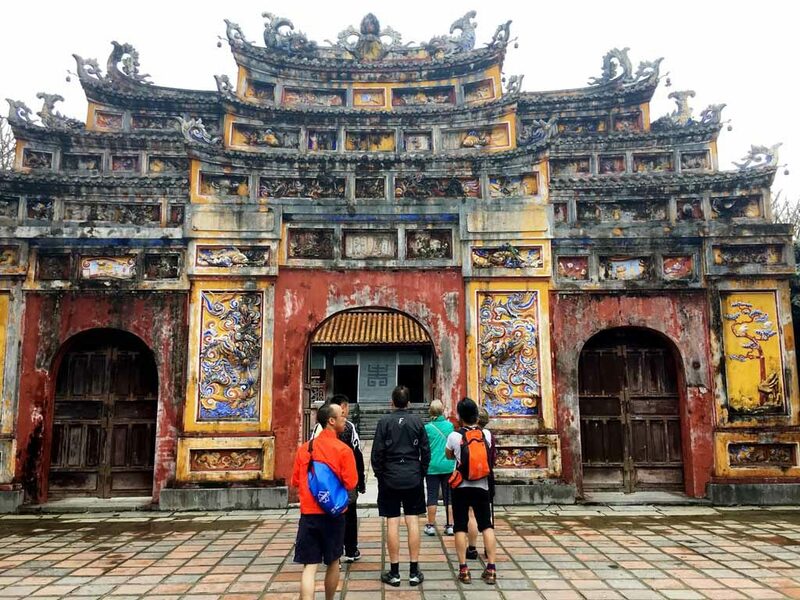 A large majority of Vietnamese people consider themselves culturally Buddhist, though few practice the religion, according to tour guide Son Nguyen. 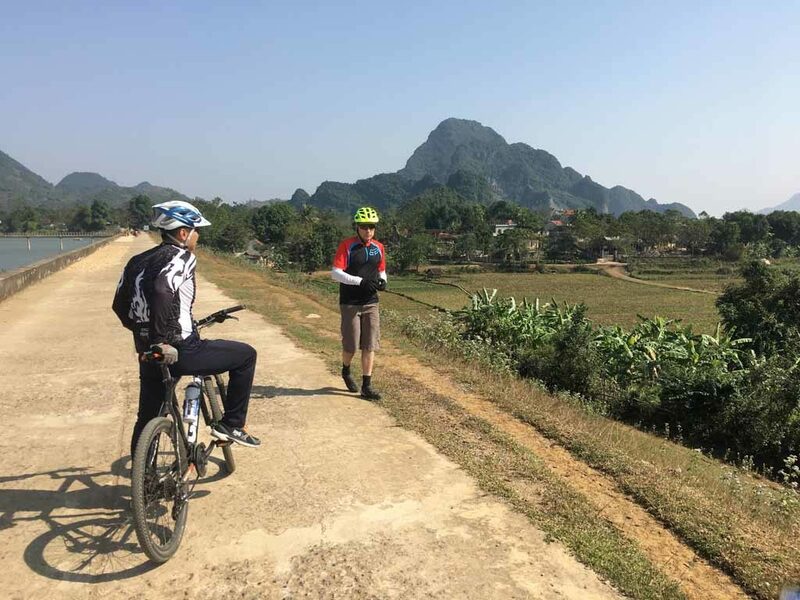 Cost: 15-day Vietnam bicycle trips start at $1,743, including hotels, bike use, 13 breakfasts, 11 lunches and two dinners. Visa: U.S. citizens must arrange in advance for a tourist visa. You can avoid sending your passport to the Vietnamese embassy in Washington by arranging for a “visa on arrival” through one of several agencies recognized by the Vietnamese government. We used Vietnam Visa Center. Cost for a one-month, single-entry visa is $20 and an extra $50 cash when you pick up the visa at the arrival airport. Weather: Vietnam is hot and humid, not unlike Florida. If you go in the winter, though, be prepared for temperatures in the 40s and 50s in the north. Training: Those who bicycle long distances regularly won’t need special preparation, although hill work is recommended; nearby places include Lake Hollingsworth neighborhoods, the Ridge and the hills north of Clermont. My wife and I gradually built to longer distance riding of up to 60 miles in the months before the trip and were happy we did. Saddles: Intrepid allows riders to bring their own bike seats. I did and was glad to change into it after I tried the one that came on the bike the first few days and ended up sore. My wife brought a noseless seat and was the only person on our tour who did not feel the need to wear padded shorts. Apps: Because you’ll have a little time to explore some of the cities, it helps to download an offline map and a country guide to your mobile; I found the Maps.me and Triposo Vietnam apps helpful. 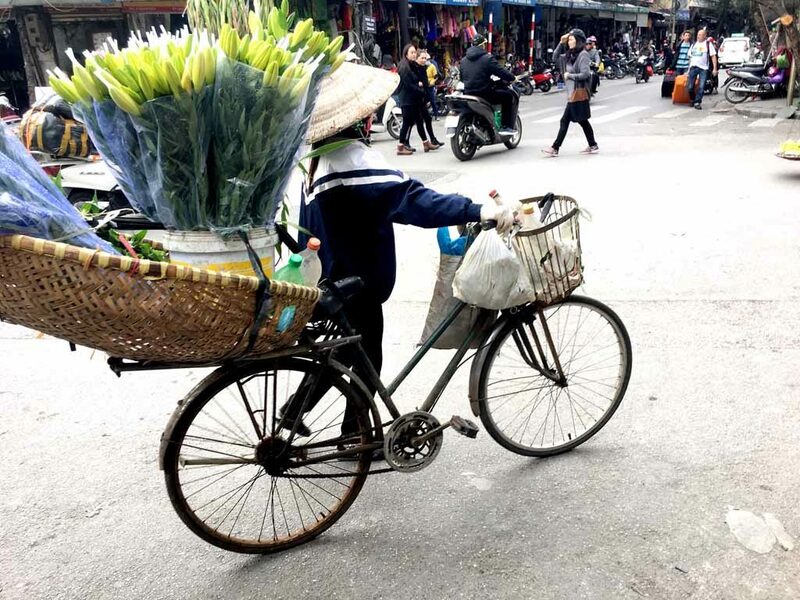 A vendor walks her flower-laden bicycle through a busy market street in the “old quarter” of Hanoi. Barry – this is wonderful.